No matter the event, the Bounce Castle With Mini Slide will make it a blast. This bouncy castle features a covered roof for sun protection. Made of flame-retardant material, this bouncy house was made for safety and fun. This bouncy castle features a mini slide for added fun and easy entry and exit. The Bounce With Mini Slide is a great unit for kids of a variety of ages. 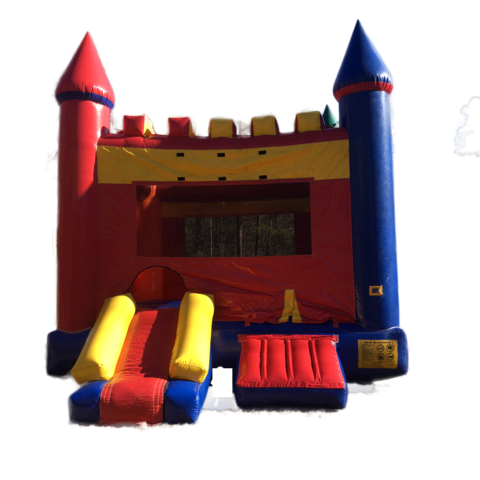 This castle-style inflatable rental has a step to make it easy for kids to enter, as well as a slide to make even leaving the bouncy house fun. It also features mesh netting all the way around it for easy viewing from all angles. Make your next promotional event or birthday party a success by reserving this bouncy castle today!